Video Duct. Photo by Aaron Rhodes. In the middle of a highly chaotic summer at Kum-N-Go came a highly chaotic Fourth Of July gig. Originally intended to raise funds for a house PA, several roommates later allocated the money to help pay high electric bills. 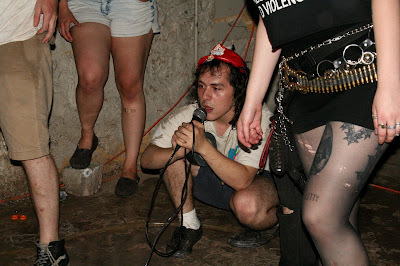 Columbia, Missouri's Video Duct traveled to play a rare set of manic, nonsensical punk rock. This set was interrupted briefly due to a police officer pulling up to the front of the house -- apparently due to an unruly attendee kicking a bottle into the street -- and picked up after a recorder rendition of the national anthem. Video Duct took joyful, rolling-on-the-floor, banging-on-a-pan rock-n-roll chaos to the nth degree. Tazer Tot's set included a charming cover of Fleetwood Mac's "Rhiannon" (sans a guitar solo), Nitecrawlers played the perfect, rowdy set for all the punks that had been boozing and lighting off fireworks on the front lawn, and Fraydee Cat brought a hush over the basement with their endless array of colorful, looping melodies.